If you suffer from depression or moodiness, take a look at how bright your home is in your bedroom and bathroom at night. You may just need to get a different night light. A new study shows that the color of the light you're exposed to after you go to sleep could explain your moodiness. I've talked before about how exposure to light before bedtime can cause interrupted sleep. That's why reading or watching television right before falling asleep can affect how well you sleep. Now we're seeing that a single night light in your bathroom can affect your moods - especially if it's a white or blue light. I had changed all of my night lights to those emitting a blue light because I liked their design. Little did I know that these designer lights could keep me from going back to sleep after a bathroom break or cause a slight depression. Then I read this study from the Ohio State University linking changes in the brain to depression in hamsters exposed to blue or white lights. The animals did much better when exposed to red lights, and those that slept in complete darkness did best of all. According to the study, blue lights had the worst effect on mood, with white light a close second. The researchers looked at specialized photosensitive cells in the retina, ipRGCs, which help the brain regulate the body's circadian clock. Our circadian clocks help tell us when to feel sleepy and when to feel alert. These cells' messages may also affect mood and emotion. Study co-author Tracy Bedrosian explained, "Light at night may result in parts of the brain regulating mood receiving signals during times of the day when they shouldn't. This may be why light at night seems to be linked to depression in some people." 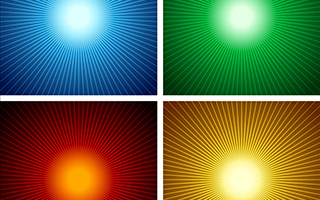 Because different colors of light are actually different wavelengths, the ipRGCs react to them in various ways. The cells are most sensitive to blue wavelengths but least sensitive to red. To see the effects of the various colors, researchers exposed adult female Siberian hamsters to no light, dim red light, dim white light, or dim blue light at night for four weeks. Then they conducted several standard tests to see if the hamsters exhibited signs of depression. For example, hamsters typically enjoy sugar water, and if they drink less than normal, it's often indicative of mood issues. Those who had no light at night drank the most, with those exposed to red light a close second. But the hamsters exposed to the blue or white lights drank much less. Researchers also looked at the hippocampus regions in the hamsters' brains and found that those exposed to blue or white light had a significant reduction in density of dendritic spines compared to the other two groups. Dendritic spines are hair-like growths on brain cells that are used to send chemical messages between cells. A reduction in dendritic spine density can be a sign of depression. Clearly, hamsters exposed to no light or red light fared better than those exposed to blue or white. The researchers believe these findings will translate to humans as well, particularly shift workers who don't have the option of experiencing complete darkness at night. I predict we're going to hear more about red lights in the future. In fact, I'm presently researching a device that uses specific frequencies of red light to reduce symptoms in people with high blood pressure and dementia. If it works as well as I'm told, you'll hear about it in an upcoming issue of my newsletter. You won't want to miss this article, which will be available to all newsletter subscribers. If you're not a subscriber, you can sign up by following this link. The Ohio State University (2013, August 6). What color is your night light? It may affect your mood. ScienceDaily. Retrieved August 7, 2013, from http://www.sciencedaily.com/releases/2013/08/130806203150.htm.